Amish Desk in Tiger Maple. 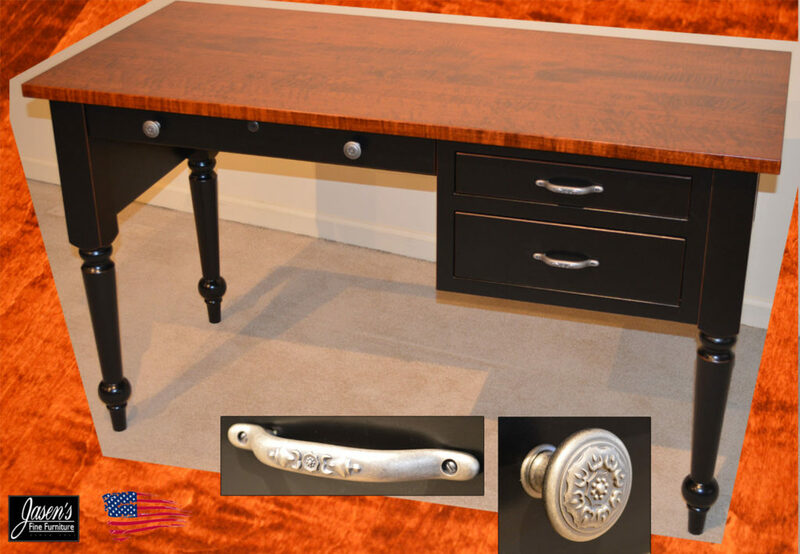 Amish Tiger Maple desk – Solid Tiger Maple top, Brown Maple with red Rub Thru black finish on base. The desk has beautiful turned legs, full extension glides on drawers, and locking pencil drawer. Amish Desk in Tiger Maple features smooth opening full extension tracks for long lasting use, catalyzed finish for an exceptional lifetime durability, and a plethora of style, finish colors, two tone options available, custom sizes, custom shapes, custom edge detail, and wood specie options in solid (oak, maple, cherry, rustic cherry, tiger oak (quarter sawn white oak), rustic tiger oak, tiger maple, walnut, grey elm, hickory, hard maple). MADE IN USA! Created by Amish craftsmen. Heirloom quality office furniture your family will enjoy for many generations to come.